Dazzle your guests with these sophisticated wine glass charms favors. 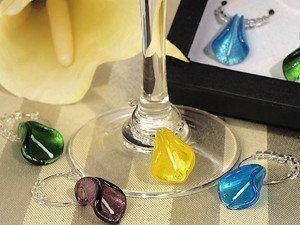 these handcrafted glass wine charms are stunning and will wow your guests with it's elegance and style. Then you can pick Birthday, anniversary, wedding or thank you card. Each is attached to a chrome ring with delicate bead accents and will be enjoyed by the wine enthusiast in the crowd. This favor is sure to impress your guest with it's sophistication and elegant design. They each come packaged 4 per set in a black gift box with window for viewing the elegance. They measure approximately 1" x 1".